ODS, an acronym for Open Document Spreadsheet, is a spreadsheet file format that is part of the Open Document Format for Office Applications (ODF) that also includes chart, presentation, and text documents. ODF is an open file specification based on the XML format, developed by OASIS (Organization for the Advancement of Structured Information Standards) and implemented by the OpenOffice.org suite of office applications. It was first published in November 2006. ODS files, which use the file extension ‘.ods’, are in fact of two types. File Type 1 is created using Microsoft's Outlook Express (version 5) email client application and is used to store and save messages in Outlook. It is similar to the DBX file used by the other versions of Outlook Express. This ODS file type is a proprietary format used by Microsoft software and can directly be opened by the Windows’ Microsoft Outlook Express. ODS File Type 2 is the spreadsheet created by the Calc program included in the StarOffice or the OpenOffice office suite, and formatted using the OASIS OpenDocument XML-based standard. This file type consists of tables capable of tracking information, different kinds of declarations, numerical data, mathematical formulas and graphs. Each table and its analysis are enclosed in the document epilogue or prelude. The document prelude is at the beginning of the file and consists of form data, the settings for calculation of formulas, rules for validating cell content, information for track changing, and label change declarations. The database ranges, named expression declarations, consolidation operations, data pilot tables, and DDE links are contained in the epilogue. Various attributes may also be saved in the settings to protect the files so that other users may not delete, move, insert, or rename files. Passwords can also be specified so as to prevent other users from resetting the files. When the file is protected in this way, the file extension takes the form ‘.ods#’. 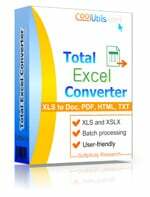 This ODS file type can be opened directly using OpenOffice.org Calc (on Windows, Mac, and Unix), or converted to XLS, PDF, HTML, ODT, TXT or other formats by Total Excel Converter.